The only thing in my incense is real ingredients. This means the scent of sage, comes from sage! NOT sage fragrance oil, not even sage essential oil. SAGE. Like the kind you put in your cooking. I just add makko, which is the inner-bark from a tree in Asia, to keep the mixtures burning, and acacia gum to bind it all together. First, I purchase my scenting ingredients. These herbs are air-dried and then ground to a fine powder and mixed with the tree bark according to my recipes. The acacia gum is mixed with water and added to my herb mixtures to create a dough-like substance. From there I just measure out the proper quantities and roll up sticks or cones by hand. I did not begin my journey in life ever thinking I would end up an incense-maker, I actually have my training in performing and visual arts (that's right, I wanted to work in theatre; that's my headshot up there!) After having my daughter however, I wanted to find a more stable way to support her while still feeding my creative spirit. I started making hippie clothing and actually began incense as a “quick and easy” side project; a way to support my clothing-making. I am sad to say, I did not do enough research at that time, and actually started by making “hand-dipped” incense. It didn’t take me long to realize that this kind of incense is not real. The process involves buying unscented sticks, soaking them in harsh chemical fragrance oils and then drying them. I didn’t feel good selling that kind of stuff to people while marketing it as good quality incense, considering that I, myself, was breaking out in rashes from working with the oils! So I researched harder and got back to basics. I began to gather some favourite natural ingredients, (cinnamon, vanilla beans, sage etc.) and try out different combinations. (I try to buy locally whenever possible but when not, I buy fair-trade from Nepal.) From these real ingredients, I created my recipes. Bark is added to the mixture to keep it burning (this avoids using charcoal, which contains saltpeter, a toxin). Then, I create an almost play-dough-like substance by adding some water and tree gum or resin. From this dough, I roll my sticks and cones. 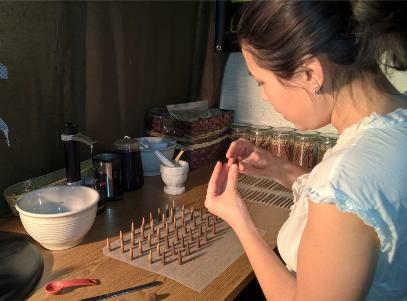 It is incredibly time-consuming compared to “hand-dipped” incense, but it is something I am proud to make and feel I can stand behind. Working with these natural products is also incredibly relaxing just due to their natural properties, when compared to the stress I felt making clothing, there was no contest. I happily traded up my sewing machine for a mortar and pestle! I am always experimenting with different combinations, so my current list of 12 scents is ever-growing. Sometimes happy mistakes make the best mixes! Cinnamon Sage , for instance, is the result of the two jars falling off a shelf and breaking on my office floor. I thought it was going to smell weird, but instead, it smelt amazing, so, off I went and created a recipe! I hope you will enjoy these unique scent recipes, they were made with peace, love and happiness!